Co-Optimus - Video - New Ghostbusters Trailer Features Movie Footage, also Ghost Fishing. New Ghostbusters Trailer Features Movie Footage, also Ghost Fishing. Familiarity among geeks is essential when taking something we love and introducing it in a new medium. To emphasize the familiar, the new Ghostbusters trailer features movie footage from 1984, and an important lesson delivered by Harold Ramis: Don't look directly into the trap. I can only imagine that the film footage was also to show off the likeness in both features and voice. I was impressed with how everything looks, and noticed a bit of Ghost-fishing with the way the streams seem to work. 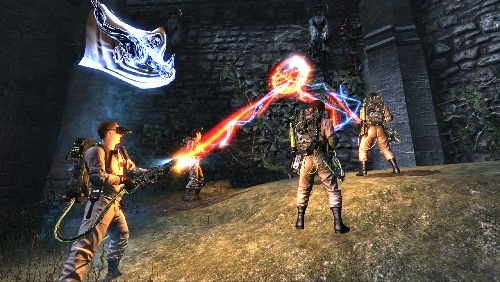 Atari and Sony Pictures definitely seem to be pushing for this game to be accepted as the third installment in a Ghostbusters trilogy, and we certainly don't mind original stories for games in a familiar, beloved franchise! Take a look for yourself. After your done, perhaps you want to read our NY Comic-Con details on the game.